Get the facts behind the demise of the desk phone in our webinar for forward thinking IT leaders. In one of our recent posts, we debunked a few of the most common misconceptions about flexible working. For example, instead of adversely affecting culture and productivity, research has repeatedly shown that companies embracing the era of “anywhere workers” actually see improved employee happiness and productivity. But there’s one thing about flexible working that is no myth: it’s killing the desk phone. Only 10 years have passed since Apple released its first iPhone, yet we treat our personal smartphones and tablets as though they’ve always been essential to the way we work and live. As a result, in a short decade, those devices have completely disrupted IT. They have made it easier than ever to work anytime, from anywhere, inspiring companies to review their policies and to increasingly adopt intuitive, cloud-based technologies that support newer, faster, more efficient forms of communication and collaboration. In the process, many organizations have discovered that the traditional business phone—the clunky device with an overwhelming array of buttons—no longer serves the newly mobile needs of their employees. According to research from GlobalWorkplaceAnalytics.com, employees at Fortune 1000 companies are not at their desks 50-60% of the time. Similarly, Dialpad’s recent survey The Era of the Anywhere Worker found that only 19% of respondents work at a desk 40 or more hours per week. Over half (53%) said that the desk phone is outdated, and nearly one-third of respondents believe desk phones won’t exist three years from now. So what does this mean for CIOs? It means it’s long past time to evaluate the efficacy of the desk phone—and whether employees are even using them. At Motorola Solutions, for example, Dialpad found that 50% of employees were using their desk phones only ten times per month. Most conversations were redirected to mobile phones so they could happen on-the-go. Even though 75% of employees prefer a mobile smartphone over a desk phone for business calls, the majority (66%) of companies still provide employees with desk phones. And that’s not a harmless discrepancy: unused phone systems, according to IDG, cost enterprises an average of $8.1 million per year. That’s a significant investment for an outdated technology that doesn’t solve the needs of today’s anywhere workers. Some enterprises may already have cloud communications systems in place, but too often these are first-generation services (dating from the early 2000s) that still rely on desk phones. While they may have been effective at one time, forward-thinking CIOs understand that the best option for anywhere workers is to use their mobile devices—smartphones, laptops, tablets. In his recent report, Cord-Cutting Hits the Enterprise, Brian Solis (Principal Analyst, Altimeter Group) recommends that CIOs and IT leaders review usage of their existing systems to see what is and isn’t working for employees. Then you can evaluate the impact of these systems on both productivity and employee satisfaction. Solis also recommends surveying employees before making any decisions to help save time, money, and headaches further down the road. 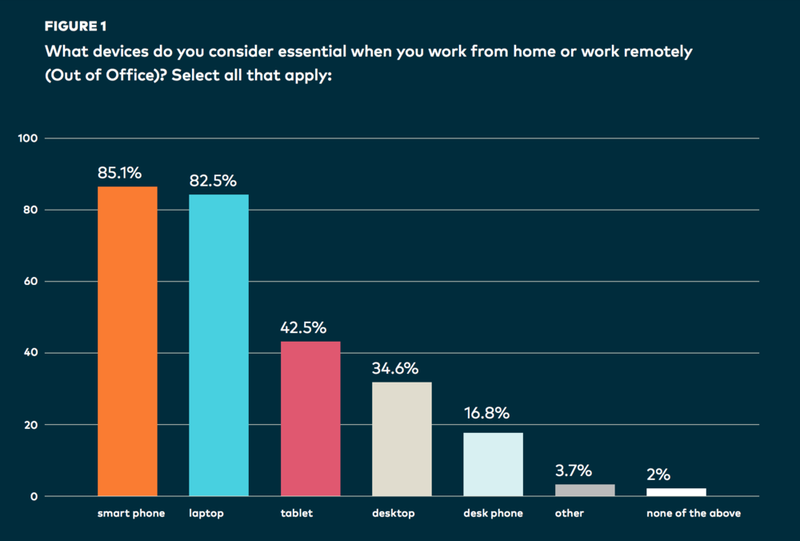 For example, in the above chart from a Dialpad survey, employees said that the smartphone tops the list of essential devices for remote work at 85.1%—useful data when implementing new technology. Every organization will have different needs, so CIOs should make sure these when developing their company-wide plan for communication and collaboration. One thing is for certain, however, no matter the kind of company or industry: the demise of the desk phone is near. Got questions on what cutting the cord means for your business? Brian Solis talks through the practicalities of cord-cutting in enterprise in 2017 in this enlightening webinar available on demand. The session is an ideal opportunity for forward-thinking IT leaders to learn from one of the leading minds in disruptive technology, and to understand what's next for business communications.